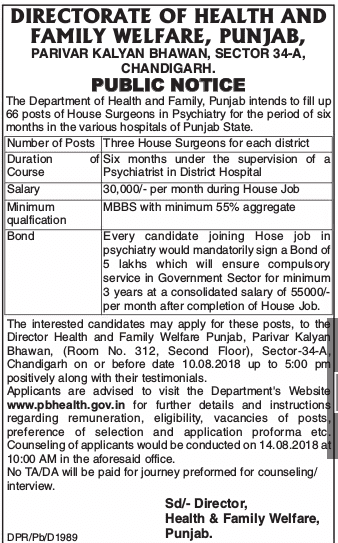 Directorate Health & Family Welfare (DHFW), Punjab has released the official notification for the hiring vacancies of Representatives, Psychiatrist, & Other Posts. Candidates who have satisfied the eligibility criteria mentioned below for DHFW Recruitment 2018 for Representatives, Psychiatrist, & Other Posts. The last date to apply for this post is 10th August 2018. Important Details like educational qualification, age limit, application fee, selection process and online application form and notification are mentioned below. Moreover, refer official notification for completed details. The official notification of Directorate Health & Family Welfare Vacancy 2018 Online Application form Representatives, Psychiatrist, & Other Posts is attached below. Educational Qualification:- Candidates who are going to fill the DHFW Punjab 2018 Application Form, they must have possessed the postgraduate degree or diploma in the psychiatrist from recognized university or board. For more details refer official notification. Home Surgeon: MBBS with minimum 55% marks. The candidates joining house job in Psychiatry would mandatory sign a bond of 05 lakhs which will ensure compulsory service in Government Sector for minimum 03-years at a consolidated salary of Rs. 50000/- per month after completion of House Job. Age Limit:- Candidate’s age should less than 67 years as per official notification. Pay Scale:- Selected candidates will get the pay scale of Rs. 30000/- per month. For more details refer official notification. Click on the career/ Recruitment/ Advertisement section. Fill the essential and appropriate information such as candidate’s name, Name of post, father’s name, contact number, qualification, experience, age, date of birth, etc. and paste your recent passport size photograph. Attach photocopies of all the necessary documents or testimonials like qualification, experience, address proof, caste, proof of age certificate etc.